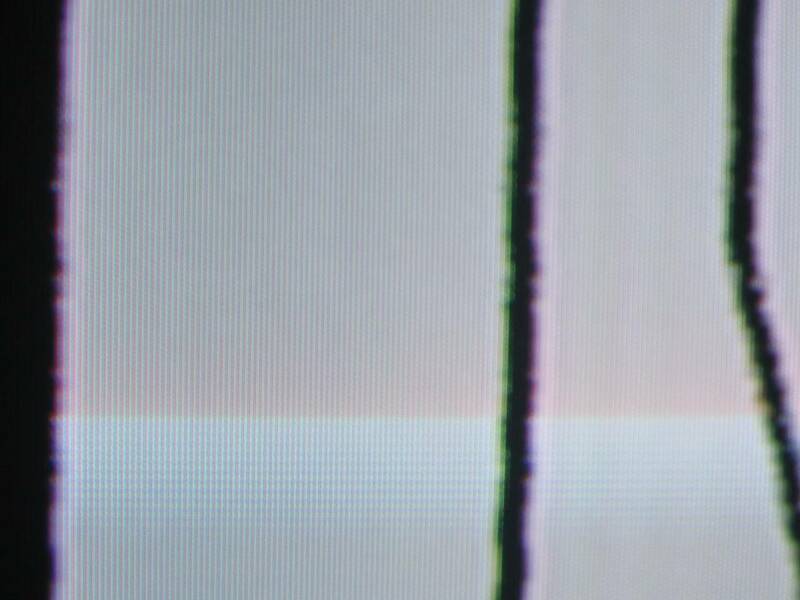 I’ve finally coded the program that produces a video signal. There weren’t too many surprises. One issue I had was that there was that occasionally a line would be drawn slightly to the right. I changed the interrupt priority from 7 to 0, and disabled ChibiOS’ thread preemption. Probably only changing the interrupt will do, but I had no trouble after that. A bigger problem is that any vertical line wriggles around on the screen a lot. I don’t think there’s anything in my code that might cause this. I came across a question on the STM site, which suggests that an instruction must complete before an interrupt will be triggered. If the CPU happens to be running a long instruction, the line produced by the following interrupt will be shifted over slightly. The Arduino TV-Out library doesn’t have this problem, even though the AVRs instructions can take different amounts of time. I’m not sure what I can do about this – the timer should still be correct, so maybe I’d need a busy-wait loop while waiting for the timer to hit a particular value. It looks like the TV-Out library does this. It might need some assembler, which I don’t plan to learn right now (but maybe check this ST forum post). But the author of the RBox suggests it’s because of the wait states. I don’t know why there would be anything non-deterministic with wait states, unless there was caching involved, which I don’t think the STM32 has. I suspect it’s ChibiOS running stuff during the timing interrupt, which would cause jitter. I don’t plan to do any more work on this program, since it’s served its task of teaching me about ARM processors. It has potential to show data its capturing or interacting with an operator. There’s plenty of memory for a framebuffer for its its 400×288 display, It should be fairly easy to port the TVOut library to it, to add graphics and text rendering capabilities. The advantage of the ARM chip is that because it uses DMA to write to the screen, the CPU is doing almost nothing while it’s displaying an image. An AVR needs to work hard while a line is being drawn. I’ve seen one project where an ARM chip produced colour signals. The CPU didn’t have DMA though, but was faster than the STM32L. The Freescale Freedom board looks like a good target (although ChibiOS doesn’t support it yet). I was thinking about the way that 2D polygons are drawn, and I think it might be possible to render a number of 3D polygons with occlusion as each line is being drawn. The unusual part of this rendering is that instead of the frame rate slowing when the CPU was busy, the vertical resolution would decrease instead as the previous line keeps getting rendered as a new line is being drawn. Generating video signals like is is nifty, but maybe a bit pointless since there are chips around with composite output anyway. The OLinuXino iMX233 would be ideal for this, as its CPU has a complete reference manual available. It’s designed for running Linux, but some low level programming like I did here would provide an “instant-on” function. The same could be done with the Raspberry Pi, but since there’s no user manual available, you’d need to rely on its limited documentation and Linux drivers. I like the idea of porting the RTEMS operating system to the OLinuXino, since that OS provides a POSIX API and BSD networking, so porting other applications would be easier. MEM2MEM I’m transferring from memory to a peripheral, so this should be off. PL I’ll make this “very high” priority, because I want to keep the picture stable at all costs. If a program writes to the framebuffer during this DMA transfer, it will be blocked. MSIZE I’ve set the SPI port to 8 bits so I’ll stick with that. I don’t think it will make any difference whether it’s 8 or 16. PINC I guess this should be off, because to write SPI you keep sending data to the same memory location. CIRC I don’t want the memory pointer to circle around. Interrupts I won’t need any yet, but eventually I’ll have to turn off the SPI port at the end of the transfer, otherwise I’ll get white bars down the sides of the screen. DMA_CNDTRx contains how much data to transfer. There are 7 channels, and table 40 of the reference manual says SPI2_TX is on channel 5. This needs to be set to the number of pixels / 8, since I’ll have 8 pixels in one byte. There’s a “auto-reload” setting somewhere which resets this counter value after a transfer; I think this happens in circular mode. Table 40 also suggests I must use DMA1 for these transfers. The peripheral address register should point to the SPI data register (&(SPI2->DR)), and the memory register is the start of the current line of pixels. The peripheral DMA requests can be independently activated/de-activated by programming the DMA control bit in the registers of the corresponding peripheral. I guess this is the TXDMAEN bit in the SPI_CR2 register. The first transfer address is the one programmed in the DMA_CPARx/DMA_CMARx registers. During transfer operations, these registers keep the initially programmed value. The current transfer addresses (in the current internal peripheral/memory address register) are not accessible by software. This suggests that I only need to set these at the start and shouldn’t need to touch them again. I still haven’t got anything, so I tried setting the source and destination registers each time before I start a DMA transfer. It looks like now I get a single transfer, but I’m trying to get a transfer on every hsync. I poked around with the debugger, especially at 0x40026058 which is DMA5->CCR1 (I calculated the address from values in stm32l1xx.h), and noticed that the Enable flag is still set. Maybe it has to be toggled each time? Now I get a square wave instead of my data… I then tried decreasing my hsync timer, and decreasing the SPI speed, and I got a reasonable output. I’m getting some nasty aliasing on my DSO Nano though, maybe I should have borrowed a faster scope! I think I was triggering the DMA transfers too quickly, which produced that square wave. Conveniently, I notice the SPI line is now low when it’s idle, which is the output I want. I’m not sure why it’s gone low, but I’m not complaining. I didn’t need to reset CMAR and CPAR after all. I think that’s now demonstrated everything I need for the video signal generator! My code needs a big cleanup, and I’d like to use ChibiOS functions where I can (palSetPadMode instead of messing around with memory locations and data structures, etc). I plan to use SPI to send the picture data for my video generator. First I need to work out what speed to run the port at. Each line goes for 52 μs, or 1664 cycles. I could divide this by 4 for 416 pixels per line or 8 for 208 per line. This sets the baud rate, so I shouldn’t need to divide this by 8 again to get a bytes per second speed. It looks (from the clock registers) like SPI1 is connected to the APB2 clock, and SPI2 is connected to APB1. I’m already running APB1 at the system clock (32MHz), so I’d like to use that if I can. The speed is set in the CR1 register, by the BR bits, which supports dividing by 4 or 8. I might as well use SPI2. The datasheet says that SPI2_MOSI can only be on pin B15. I won’t need the clock output, so I won’t configure a pin for that. The CR1 register contains a setting for 8 or 16-bit operation. This affects the size of the data being written. Since I plan to use DMA I’ll leave it at 8 bits. It turns out there are very few settings to get SPI working. I had to stuff around a lot before I got it working though – eventually I copied the ChibiOS code, and set the SPI_CR1_CPOL, SPI_CR1_SSM, SPI_CR1_SSI and SPI_CR2_SSOE flags even though I wouldn’t have thought I need them, and it suddenly worked! To send data, write bytes to SPI2->DR. The output appears on PB15. I think in the future I’ll try using palSetPadMode for configuring the pins, since it’s better than the 8 lines of code I’ve been using previously to do this. The above code divides the clock by 256 so I could see the output on my DSO Nano, but I’ll change this to 4 later. The next step will be using DMA to write the data to SPI instead. | TIM_CR1_CEN; // counter enable... proably important! I’ll attach my DSO Nano to PB9, and… nothing! I don’t think it’s the DSO; that should be good to a few μs. There is NO WARRANTY, to the extent permitted by law. Type "show copying"
The value is changing – that’s a good start! Note that I didn’t have to continue the program to see the timer incrementing – it runs even though the debugger has stopped execution! Also, the timer never seems to set the top 4 bits, which suggests it’s resetting at some value before it overflows its 16 bits. This maximum value should be 32MHz*64μs=0x800, so it’s looking good. There’s an application note discussing the timers in the STM32 chips, and reading that closely it looks like I’ve been confusing the “output compare” mode and the PWM mode. I think in the AVR these are essentially the same, but in the STM32 there doesn’t look like there’s a way to reset the pin upon overflow when in output compare mode (so this mode doesn’t seem to be that useful to me, apart from one-shot events). The ChibiOS PWM code is worth looking at too. and finally I get some output! The timing looks right, but there’s some strange stuff happening with the amplitude of this waveform. I’m hoping it’s aliasing with my DSO, so hopefully I’ll get to use a CRO in a few days to confirm this. I made the timings a bit longer, and it didn’t look as bad, but maybe there’s some other aliasing going on with the clocks in the chip. Another problem is that the waveform is the wrong way around! There seem to be two settings that affect this: the OC1M bits in CCMR1, which say whether the waveform is active when the counter is less than the compare register; the other specifies the polarity of the output. Maybe I only have to change one of these? It seems odd to have two registers which do mostly the same thing. I’ll change the polarity in CC1P. That’s looking better! I swapped CCER and OC1M around, and the output looked the same. I noticed that the signal doesn’t rise very quickly. Looking through the GPIO registers again, I got the OTYPER setting wrong which made it open drain. Changing this around fixed this problem. Next I need an interrupt when the signal goes low, so I can adjust the signal timings for the vertical sync. I’ve looked how ChibiOS does its timing, and worked out that it’s unsuitable for timing video signals. Now I’ll look at the using the timers directly. The chip has a number of timers, I can’t work out how many. The ChibiOS HAL manual says it can use timers 2, 3 and 4, so let’s leave those alone for other uses. That leaves timers 9, 10 and 11. If the timers work like the AVR’s timers, they work by starting at 0 and counting up to some maximum value, where the counter is reset to 0. There’s also a compare register, and when the timer matches the compare register, something can happen – we can trigger an interrupt, change the state of a pin and so on. Being able to change a pin is how PWM works. It would be nice to use PWM to produce the sync signals. I’ve found an excellent description of these signals, and at the start of each line, there’s always a falling signal. So if we set the timer’s maximum value to the end of the line, and have the signal go low when it overflows, that’s the signal start taken care of. The signal end is a bit trickier. The image shows that it varies depending on the line; further, on some of the vertical sync lines it happens twice! This means that we might need to change the value at which the signal goes high as the timer is running. The AVR can do this, but in some modes the timer register is double-buffered. If you write a new value to the timer compare register, it’s only applied the next time the timer resets. They do this so you don’t set a compare value lower than the current register, which means the timer will keep counting up until it overflows! It is loaded permanently if the preload feature is not selected in the TIMx_CCMR1 register (bit OC1PE). Else the preload value is copied in the active capture/compare 1 register when an update event occurs. The update event is sent when the counter reaches the overflow and if the UDIS bit equals 0 in the TIMx_CR1 register. So all we need to do is update the compare register one line early! This also shows that the maximum value will need to be changed in the same way. In the reference manual, they call this value the “auto-reload” value, and it’s kept in the TIMx_ARR register. Section 17.4.1 suggests you can choose whether this is double-buffered or not. We might as well use this feature since the compare register needs it. There’s one more thing to look at. At the start of each line, I’ll need to start transferring data from memory to an external port using DMA, and configure the compare and maybe the maximum value register for the next line. I could either do both in a single interrupt, or set the registers on the reset interrupt, and start the DMA on the compare interrupt. Do we have enough time from the start of the interrupt to do anything useful? 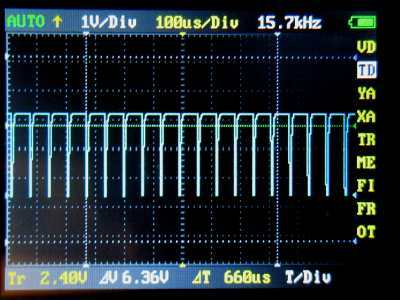 The horizontal sync pulse on a PAL signal is 4.7μs. If we assume the CPU runs at 16MHz, this is about 75 instructions. Section 5.5.1 of the ARM manual suggests that it takes 12 cycles to enter an interrupt. In the AVR, it’s up to the programmer to save the register state at the start of an interrupt. This means it’s a good idea to do as little as possible in an interrupt, because the compiler inserts lots of “push” and “pop” instructions around the interrupt. Since the ARM looks after this for you, and takes a fixed amount of time to enter an interrupt, this isn’t a problem. If we assume it takes 12 cycles to leave an interrupt too, that leaves about 50 cycles to do stuff. This stuff is working out how long it should take to raise the signal again, and set the compare register and maybe the reset register. That should be all we need to know about the timers – now I’ll try to use the timer to produce these horizontal sync pulses. All code samples on this site are in the public domain - do what you want with them.